1- Walking to the ground, the wind howling around us much as it did prior to the same regular-season fixture last year, it was difficult to escape the thought that we could probably have done without this one at this stage. I missed what was widely lauded as The Turning of The Corner last Sunday, but such positive steps as we have been taking are delicate, precarious things. Like an addict walking away from their vice, one day, one game at a time. It wouldn’t take much to take us back to square one, and our forthcoming run of more plausibly winnable-looking games would have seemed a lot more inviting without a trip to rampant Leicester in the meantime. A Leicester who gave us a mauling at our place in November that had more subtext than Alice in Wonderland. 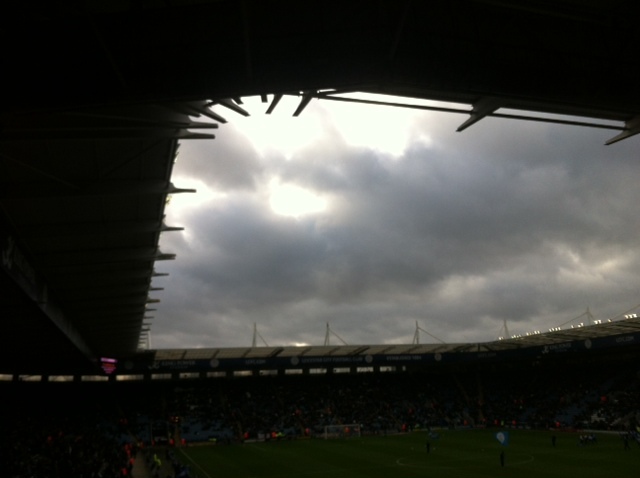 So, much as there was a sense of cup-tie nothing-to-looseness there was something more than a little ominous about the way that the bright blue sky was gradually blotted out by stormclouds as kick-off approached. 2- Having said all of which the impossible swirling wind, wind that was strong enough to make eating chips outside the ground a Krypton Factor level exercise in dexterity, was the classic leveller. And there may have been something at the back of Leicester’s psyche, the knowledge that the winning run would end sometime, that this one would take that run into double figures, and that, you know, it was us. History’n’that. In any event, we didn’t start the game in the manner of a side that had rolled up either expecting to be scalped or hoping to park the bus. Deeney slugged a shot narrowly over the bar… then Tözsér’s curled free kick dropped to Faraoni flying in at the far post, his header into the side-netting. And then we were ahead… Deeney curled the ball across from the left. Cross? Shot? Either way ‘nando was alert and threw himself across the ball to power a header home. One-nil, and suitably unrestrained acknowledgement in the low-roofed away end. The game continued to hurtle around in the manner of the weather… Manu came out for one of any number of City corners, the wind caught the ball and carried it goalwards and the keeper was forced to change direction and tip over, a fine stop. Angella came close to outdoing his Forest effort, flicking up a corner to scissor a volley goalwards, Schmeichel responded with a stunning reaction save. And then two… Forestieri, a dynamic box of tricks throughout, hounded down de Laet in the right-back position and laid back to Anya. Anya squared to Murray who fashioned a space and then drove past Schmeichel. 3- So did we blow it? If we did it was in the period of play that immediately followed our second goal. We’d responded impeccably to going ahead, staying on the front foot, staying aggressive and retaining our discipline. After Murray’s goal however City came at us down their right, de Laet squared and James tucked away tidily, our two goal lead halved straight away. A decent move, but we repelled the many other decent moves that City threw at us throughout the rest of the game. Here we seemed a little bit dazed, a little bit too pleased with ourselves and perhaps ready for the interval… whereas City got straight back at us and brought the deficit back to a single goal immediately. But this was very, very far from the Nottingham Forest disaster ten days ago. Leicester are a far more accomplished opponent and threw more at us than their Midlands neighbours had at the City Ground, particularly in a second half that was a classic kitchen sink job for the most part, City throw numbers forward, we put bodies on the line and try to catch them on the break. And we did a bloody good job of it too… the home side didn’t eke out many chances for all their possession, and showed signs of not being used to being in this position – Kasper Schmeichel at one point flying out to deny an already offside Forestieri took a risk with a waist high attempted volley that was closer to connecting with the Argentine than the ball – fortunately for the Dane he missed both. Yes, yes, they got the goal, and a fine strike too into roughly the same corner as Nathaniel Chalobah’s howitzer had flown nine months ago (yup). Rather they hadn’t, naturally, but if it were to happen you’d rather it was that way… them earning the draw with a worldy rather than us messing up to throw it away. Because, yes, Drinkwater could perhaps have been closed down, and, yes, we’d had chances to put it to bed… not least Forestieri, released by an astonishing reverse-pass from Ekstrand, who overhit a cross to Deeney on the break when a shot across the face looked like the better bet. Such criticisms are churlish; this was a massive performance that nearly yielded a massive result. Three away games on the hop we’ve let two goal leads slip, true, but you’ve got to give high quality opposition some credit too. Of the three games, only at Forest did we do any throwing away. 4- My first view of Daniel “Kaiser” Tözsér, and if this wasn’t the masterful performance that dispatches from Brighton reported, the Hungarian nonetheless looked a valuable addition to the side on any number of levels. For the first time this season the team has a pendulum, someone setting the rhythm from the back of the midfield… and, do not scratch your eyes, someone shouting and cajoling and organising, bringing the defence out, directing. I remember that… that’s a captain that is. Add a suave set piece delivery and you’ve got a big tick on this outing, only a silly yellow for a needless foul blotting his copybook. Elsewhere, other than Forestieri, highlights included the performances of Cassetti, a perhaps surprising call in the centre of the defence for Hall, and for the impeccable Angella. So too the splendid Human League-inspired chant for Daniel Pudil (“Daniel Pudil Baby….”), which one can only hope will start a trend for early eighties adaptations before Park “Too Much” Chu Young comes back from his knock. 5- Leicester were giving it large at the end of the game, not unreasonably in context although to a greater extent than a home draw against a mid-table side to terminate a winning run probably merited. They do have previous on this of course… the “we’re going to Wembley, you’re not” chants that followed their first leg play-off win in May weren’t quite on a par with Palace’s premature “Eagle Express” train to Cardiff in 2006 but they weren’t too clever nonetheless. Beyond dispute though is that we’ve had some belting games against City over the past few years (and not just the play-offs… the Danny Graham one? The Chalobah one? The Craig Forsyth one? The Heidar one?) and it seems likely that this run will now take a pause of a season at least. Difficult to dispute that they’ve merited it either… comfortably the best we’ve seen this season and a far stiffer test than the side we beat in the play-offs. We gave them a(nother) hell of a game today though. Progress. As ever, you have put the flesh on the bones of the skeleton that was the radio, twitter (which needs a ‘”that’ll come back to haunt you” button alongside “favourite”) and bbc.co.uk, so thanks once again for that. Great post Matt – pretty much the way I saw the game. I’m surprised you didn’t mention the clear mistake for their second goal which was not kicking the ball out to give Battocchio time to get some treatment. If either Battocchio or Ekstrand had simply cleared the ball into touch in the frantic few moments before their goal, I think we probably would have sealed the three points. ‘Game management’, I think commentators call it these days. Aside from the obvious disappointment of that late sucker punch, great performance and very happy Sannino has brought some much-needed solidity and organisation to this Watford side. Sure. From memory someone DID try to clear it out up the line but was fooled by the wind. Yes, we probably should have put it in Row Z and might have won the game if we had, but stuff happens, you cope with it. That’s a bit like Leicester complaining about a perceived offside in the build-up to the first goal… whether it was or it wasn’t you get on with it and deal. It was Battochio himself Matt and I don’t think he was trying to clear it out of play as he hit it left footed. I’d say it was just one of those brain farts that people have from time to time. He probably can’t explain it himself, particularly as he was the one asking to be subbed and clearly struggling in the closing moments. Much criticism from 3CR about failing to “manage the game” in the closing stages, but you can only do that if you can keep possession in midfield. Yet again we have sacrificed FF for a defender, sat back and paid the price. In fairness I don’t think there was much “sitting back” involved, we were penned back, Nando had been booked for a silly dive and looked spent. Perhaps we could have introduced Merkel at that point, but with Leicester lobbing stuff high to take advantage of the ball hanging into the wind and making it hard for Almunia to judge whether to come or not, having Fitz in there to get his bloody head on things wasn’t a bad call for me. I agree that taking a forward off allows any opposition to get at us much easily. Opposition throw a full back forward for over and underlaps. This happened at Forest and did not help the cause in any shape or form. FF is always a threat and Deeney on his own will always lose possession, so 2 players up will demand at least 3 back. Not good to watch and will bring derision from the home supporters but watch the guile that Mourinho uses with his troops. Manchester City last week was a classic. Spot on. In the 85th minute, with Forestieri knackered and just booked. Anya charging around up front felt like a much better bet, and indeed he wasn’t too far off killing the move that ended with them scoring. Thanks for rationalizing it all on our behalf, again! The one thing we’ve got to be able to take away from that is pride. And if we can continue with our heads up, who knows. I seem to recollect a song about Troy Deeney hating The Police, maybe that’s one for your 80s theme? Or Paul McCartney’s ‘Mamunia’ from Band On The Run, which is crying out for the Almunia treatment. Matt’s Park joke is, however, peerless. Not my work, some bloke on that there Twitter. But marvellous, yes. Leaving aside the actual football, I’d just like to say that ‘Park “Too Much” Chu Young’ has made my day! As above. But yes, mine too. Even if we can’t get a chant going, I think I’m bold enough to shout “Too Much Chu Young!” if he comes off the bench. I think I also remember a great Leicester game when we went down to 10 men, Hendo played on his own up front and won and held onto every ball throughout the match. His best game with us I think. Or am I remembering it wrong? indeed. O’Toole sent off – later rescinded – and Doris got the goal and played a blinder.